We hit it hard today! Fortunately, (as you can see) we got out there while there was still shade. In this photo, I have placed 2 layers of plastic under the steps to control weeds. It will be hidden by mulch. Hubby is screwing the stringers to the posts while the supervisor inspects the job. Add a few plants, some compost and mulch, a blue slab at the top and ... voila! 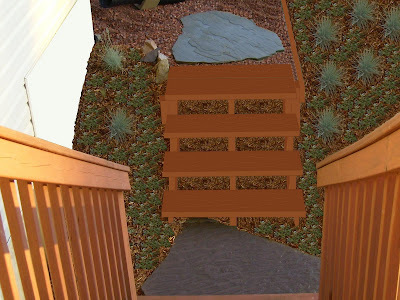 The stone steps will take off from the lower slate slab to the right and down to the patio below. Then I will continue the planting bed to the right of the steps as well. I have to wait a month or two to stain the new wood, and it will take a little while for the sedum to spread. I couldn't wait to see what it would look like, so I faked it on my computer. I love making progress! And I really love the new steps. So much better than the old muddy slope! nice job it looks like a lot of work. I like your furry helper. Looks like your supervisor is making sure everything is perfect. That is looking so good, it is going to be beautiful. I really like the slate. It looks terrific, and I really like the inspector!